New Db2 Web Query Version 2.2.1 Announced! 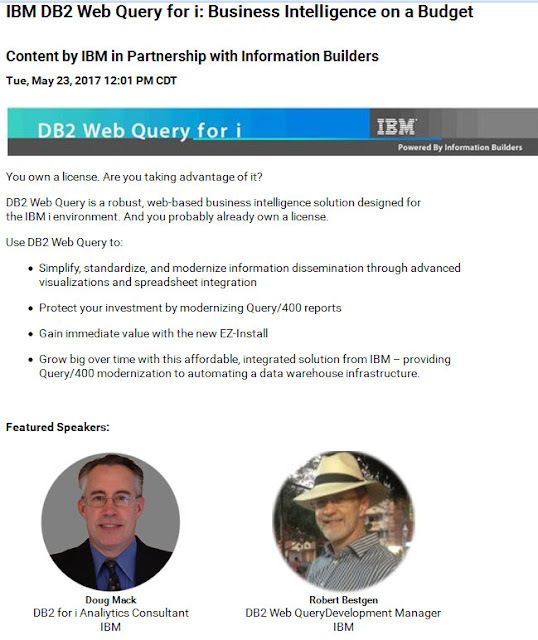 The evolution of Db2 Web Query for i continues with a new version announced on October 3rd, 2017. 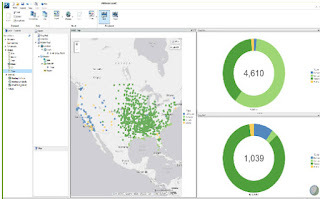 With Version 2.2.1, both the Business Intelligence product set and the DataMigrator ETL (Extract, Transformation, and Load) component are enhanced - adding several new features to address user requests as well as bring new industry features for reporting and analytics to IBM i customers. There have been several times in the history of this product where IBM has delivered minor changes, and other times when you could say the product capabilities took a major leap. An example of a big leap was when Db2 Web Query went from the Report/Graph Assist report authoring tools to the much more intuitive, powerful InfoAssist component. Another major leap was adding DataMigrator ETL with its integrated ability to un-tangle data into data marts or data warehouses. Version 2.2.1 marks another major leap! This new version, available in mid-December, extends the community of users to the data analyst (or data scientist). New powerful “data discovery” analytics and visualizations make it even easier for analysts to navigate through data to understand what is driving the business. End users will be more empowered by new features such as auto link, auto drill down, and dynamic parameter navigation. Version 2.2.1 makes it easier for the end user to iterate through data and across multiple reports without having to go back to the report author for changes in the original report(s). The ability to interactively select data on the report to create a filter will be very useful to analysts to focus on related data of interest – within the same report. Were you aware of the geographical mapping visualizations in previous versions of Web Query? In 2.2.1, this gets even more interesting with additional enrichment to bring in information to your maps quickly and easily. New “layers” on the maps support such things as adding demographic data. Learning how to build new Data Visualizations will be easier with embedded video links to walk you through the steps. Here is a complete set of Version 2.2.1 Video Demonstrations - be sure to look at the ones titled "Visualizations." Upgrading to 2.2.1 is a no charge software update (assuming you are current on software maintenance). The Db2 Web Query EZ-Install package for 2.2.1 is now available to simplify that upgrade, or you can use it to install for the first time and run the complete product set under a 70 day trial. To request the package, send an email to QU2@us.ibm.com and include your name, company name, and serial number of the system where you plan to install the software. When you're done installing we'll point you to a website for "next steps" that includes a test-drive, tutorials, and documentation on the Query/400 Discovery tool and Sample System Administration reports! One of the things I hear often at speaking engagements or by working directly with customers around the world is that they know of DB2 Web Query, would like to evaluate or get some hands on experience, but aren’t always sure how to get started and gain quick value from it. In 2016 we started thinking about ways to simplify the getting started process, and that has led to the emergence of something we’re calling the DB2 Web Query EZ-Install package! With its availability TODAY the DB2 for i Lab Services team is providing a simplified process of obtaining and installing the complete suite of DB2 Web Query trial software. The products are at the latest level (including Group PTFs already applied) and include both Express Edition, Standard Edition, and the DataMigrator ETL tool. The trial code period for this is 70 days, although you could choose to apply license keys at any time and have this become permanent (just keep in mind your license keys will dictate which components you have purchased which may be less than the entire suite you’ve got in this package). Also note that while this package is made available to you, it should not circumvent the normal ordering and acquisition process. One big benefit of the EZ-Install package is...IT'S EASY. A many step process including acquiring the code, installing it and setting it up is made much simpler by providing a one-stop shopping install package that also sets up the environment for you so when complete, you are ready to go to work. For those of you that have not previously installed DB2 Web Query, this is a great place to start. For someone with DB2 Web Query already installed, think of this as a quick way to get the latest version installed for testing or analysis purposes. Note that for existing customers with Version 1 installed, this will install Version 2.2 right next to that (if done in the same LPAR/Server). If you install the EZ-Install package in the same LPAR where you have Version 2.1 installed you should be aware that this will overlay that code with 2.2 (but EZ-Install will prompt you to make sure you really want to do that). This allows you to jump right into learning how to build reports with the InfoAssist authoring tool. Our current set of tutorials includes over 14 chapters that will make you very proficient in report authoring in no time. As part of the package we install the sample database and the meta data built over that so you're ready to dig in. Remember that middle school math class where you were given a problem to solve, but the complete answer was laid out for you in the Appendix of the book? If you skipped to the answer, it would circumvent your learning experience. So I encourage you to take on the challenge of completing the tutorials although we are admittedly giving you the appendix too! In other words, the package will contain the complete set of finished tutorial reports so if you need to compare what you’ve done against what the DB2 Web Query team has done, you have that ability. Or, use those reports to demo the product to your management. As a first time user, this might be of less interest but over time will be very beneficial to understand who is running what reports, which reports are taking the longest, and more. See my previous blog entry for some examples of these reports. The EZ-Install package will contain these monitoring and auditing reports and auto-install them. Want to get away from green screen? The EZ-Install package includes several sample reports applicable to the metrics a Systems Admin would like to monitor and report on. Visualizations are provided over such system aspects as temp storage usage, utilization metrics such as disk I/O, CPU consumption, and spool files. For clients already running Version 2.2 of DB2 Web Query, we are making these sample reports available outside of the EZ-Install package. See below for acquisition details. I just recently worked with a client that had to move to a new version of their ERP system. They were quite concerned that existing Query/400 reports would be affected by this change but had no idea how to scope that possible impact. I had them run our Discovery Tool to glean information about their current queries – how many do they have (turned out to be over 10,000), which files were used the most by these queries, which queries haven’t been used in months or years, which fields of those files are most used in selection criteria or result sets, etc. This is information gathering to assist in understanding potential impact as well as input into a modernization strategy. This Query/400 Discovery tool is now available as part of EZ-Install. It is not automatically installed as you want to read the usage guide to understand what it is doing and how to use it, but its there with some sample reports over the files that are created containing the output of the tool. NOTE: To acquire the standalone system administration samples outside of the EZ-Install package (this assumes you’ve already got Version 2.2 installed), again, send an email to QU2@us.ibm.com requesting the System Administration sample reports package and include the same information as noted above). Everything you need will be included in the email response back to you, including a link to the package, installation guide, and information on where to go from there: HINT: ibm.biz/db2wqezinstall. Please send any feedback you have for us at QU2@us.ibm.com. We'll try to support any issues as best we can. You can also reach me at mackd AT us.ibm.com or on twitter @mckdrmoly if you have questions or need assistance!